Big Brothers Big Sisters Toronto has amazing brand recognition, which is a double edge sword for an organization that has been providing its unique services for over a century. While Big Brothers Big Sisters is well known around the world, the average person thinks it is so well-run that it has everything under control. This makes fundraising a challenge because the organization has to overcome the belief among corporate and individual donors that it doesn’t have any pressing needs. 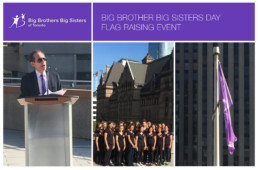 John Tory declared September 2016 to be Big Brothers Big Sisters Toronto month. The speech given by Richard Solomon, the new BBBS Toronto CEO, at the declaration gave the organization a platform to reset people’s understanding of the impacts of poverty on Toronto’s children and youth, and the role that Big Brothers Big Sisters Toronto plays in giving young Torontonians the confidence to achieve more. We worked with Richard to determine the positioning of the speech – the core message that had to be delivered in such a clear, concise and compelling the way that it changed people’s perceptions of Big Brothers Big Sisters Toronto and their understanding of the magnitude of its need. Once the strategy and structure of the speech was designed, we wrote the copy and honed both the words and their delivery with Richard so that he could capitalize on his few minutes in front of the media cameras to inspire individual and corporate donors to support the organization.